Fast Tow Truck, Heavy duty towing or rollback service anywhere in the Raleigh Triangle area! Roadside breakdowns, accidents, cars that won't start - we can help! Contact us today and let us get you back on the road! Call the wrecker service that has a fleet of light duty tow trucks and is designed to haul all types of cars and light trucks with state-of-the-art wheel lift systems. Our fleet of light duty flatbed trucks works well for hauling 4-wheel drive and specialty vehicles. Receive exceptional Emergency Roadside Service with Unlimited Recovery. We have various emergency services and experienced operators that can get you a new battery, give you a jump start, bring you a new tire, and much more. 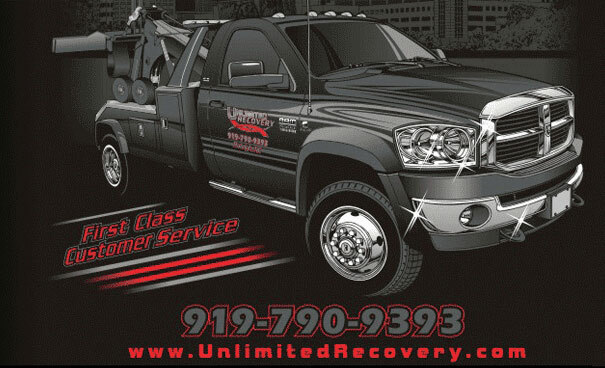 Unlimited Recovery and Towing provides complete Roadside Assistance for all automotive makes and models in the Raleigh Triangle area. Their team of experienced and trained roadside assistance professionals are prepared to provide you with the best Raleigh roadside assistance available. Their 24 hour Raleigh roadside assistance crews are always at the ready awaiting the next dispatch and can deliver fuel, change your flat tire or jump your battery and get you back on the road in minutes. We don’t get much love for this one for the non-consensual towing that we do. What IS this? Illegally parked cars need to be moved for a number of reasons. Sometimes they’re in a fire lane; sometimes they’re in a No Parking zone; sometimes they’re just taking up space in Company A’s parking lot while visiting Company B “for just a minute.” However you slice it, sometimes cars just need to be moved “non-consensually” and admittedly, this does NOT make people happy, nor lead to a lot of happy comments. We understand that. Sadly of all things that people comment on, this is the most frequently commented service. It is, though, something that we do well and conscientiously. Thanks a lot for the quick response. Being out of town and stranded on the side of the road in a motor home with the family would have been a nightmare had your company not responded so quickly. Great Towing in Raleigh, NC! A special thanks to your company for taking care of us and for providing a tow to the mechanic shop. Your operators were very professional which made the whole experience go smoothly.